How much is shipping going to cost? How quick does Emage Ship? What is Emage's return policy? We have a REAL TIME INVENTORY.If it's on the website, it should be in stock. If you order something and it's not in stock, you will be notified by email within 24 hrs. If you don't see what you're looking for on the website, feel free to email support@emage.tv to request a product. For shipping rates and options in the U.S. and Canada: -Click the "HELP" link at the bottom of the home page. -Choose "SHIPPING RATES AND SERVICE OPTIONS" from the service center list. For international rates: -Click the "questions: emagedenver@gmail.com " link at the top of the home page. -Please include what product you are ordering, city, country, and postal code in your message. Everything on our site is in stock. If you can get your order submitted by 3:00 pm MST we will do our very best to ship your order the same day. We believe in your satisfaction. If you receive your order and are unsatisfied in anyway. Please contact us for return instructions. Our entire Return Policy is located under the Help section. 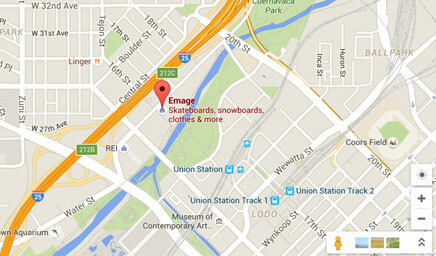 We are based in Denver, CO just down the block from the Denver Skatepark.